Dec - 14 | By: Andrew DeVigal | one comment. 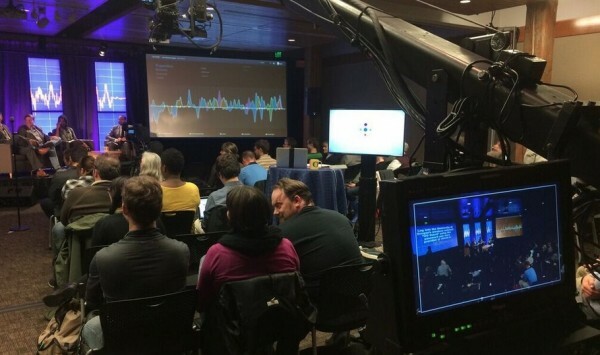 Tonight, OPB-TV will re-broadcast “Don’t Wait for the Quake,” an event hosted by Oregon Public Broadcasting and the University of Oregon’s School of Journalism and Communication (SOJC) on Nov. 17. The program will air at 9pm PT, and although tonight’s show won’t be live, A Fourth Act’s audience engagement tool Harvis will be.We invite you to join in. Some background: To promote public awareness and catalyze conversation, OPB and the SOJC convened a public forum on Nov. 17 about earthquake readiness in Oregon. In tonight’s re-broadcast of that event, OPB’s “Think Out Loud” host Dave Miller moderates a panel discussion with three experts: Andrew Phelps, director of Oregon Emergency Management; Chris Goldfinger, a geologist at Oregon State University and one of the world’s foremost experts on subduction zone earthquakes; and T. Aisha Edwards, a licensed therapist in Vancouver, Wash., who specializes in treating patients with post-traumatic stress disorder. In addition, four videos produced by SOJC undergraduate students, each with its unique perspective on earthquake preparedness and recovery, will be presented. Tonight, as we did for the live broadcast last month, we invite viewers to share their emotional responses in real time and to answer questions posed during the broadcast by using Harvis, a digital tool for audience engagement created by A Fourth Act. As the short videos are playing, you’re invited to make gestures on your smartphone in response to the content on the broadcast. We encourage you to swipe up whenever you feel motivated to act, or swipe down whenever you feel overwhelmed because of the video’s content. If you feel neutral at any particular time, simply do nothing. This “Don’t Wait for the Quake” event will be the first broadcast on OPB-TV. The original show streamed live online and over the radio last month. Because of the reach of OPB-TV and tonight’s programming, we are keenly interested in the engagement from a more geographically diverse audience than during the live broadcast in November. Although the broadcast will play a “setup” video at the beginning of the program, viewers may find it helpful beforehand to get acquainted with Harvis by watching this short video: Don’t Wait For The Quake – Using Harvis. HARVIS, developed by A Fourth Act, is a mobile web application that empowers individuals to share their perspectives and be active participants in collective action-oriented dialogue by capturing their real-time emotional responses to recorded or live-media. To learn more about it, please visit A Fourth Act.